We've been following this film for some time now and posted the first trailer back in September, and this new lengthier version which has more storyline and shows even more promise. 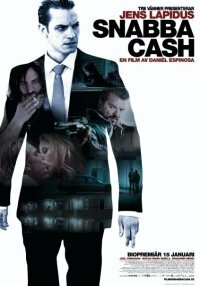 Billed as a new genre called "Stockholm noir", Easy Money is directed by Daniel Espinosa, written by Maria Karlsson and based on the novel of the same name by Jens Lapidus. JW, the Stureplan guy, deals cocaine in the hot spots of the Stockholm nightlife. The upper class guys he hangs out with don't know what an upstart he is and they can't see through his lies about his background. Jorge, the latino, knows everythign there is to know about coke. He pulls off an unbelievably stylish escape from the Correctional Institution of Osteraker. Once out he starts planning a cruel revenge on the mafia thugs who framed him. Mrado, now the mafia boss Radovan's cut-throat, was previously one of war criminal Arkan's feared men. The only thing he knows is how to indistriminately torture and torment. These three men cross paths in a way that can only end in a fight to the death. And for what? For easy money! NSFW trailer after the break. Om denne filmen er like bra som boka, gleder jeg meg som en unge!